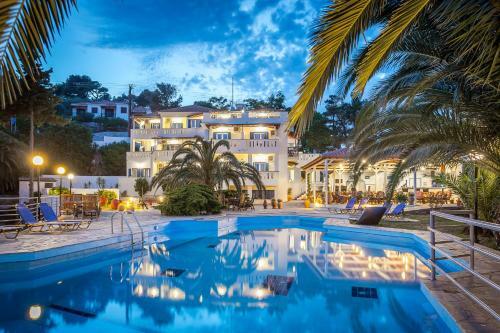 The 2-star Ostria Hotel is located in Stafylos, Skopelos. The hotel common facilities include pool bar, garden, barbeque, bar	and outdoor pool. As for the kids is children playground. The property offers studio, family room, suite, honeymoon suite, 1 bedroom apartment and other might be available upon request. The rooms offer sea view. Amenities of the rooms include air-conditioning, heating, fridge, etc. Each unit has own bathroom. In the kitchen there are kitchen utensils, hot plates, oven and fridge. Ostria Hotel works from May to October.